Last November I posted about Edwin Vazquez’s Kickstarter project for his comic “The Werewolf of NYC“. I just got my rewards package in the mail, and I think it warrants sharing here because it’s a very generous array of high-quality swag: two copies of the comic, a limited-edition t-shirt, a tattoo flash page (designed by Jenai Chin), stickers, buttons, and a hand-written thank-you note containing a limited edition piece of art. 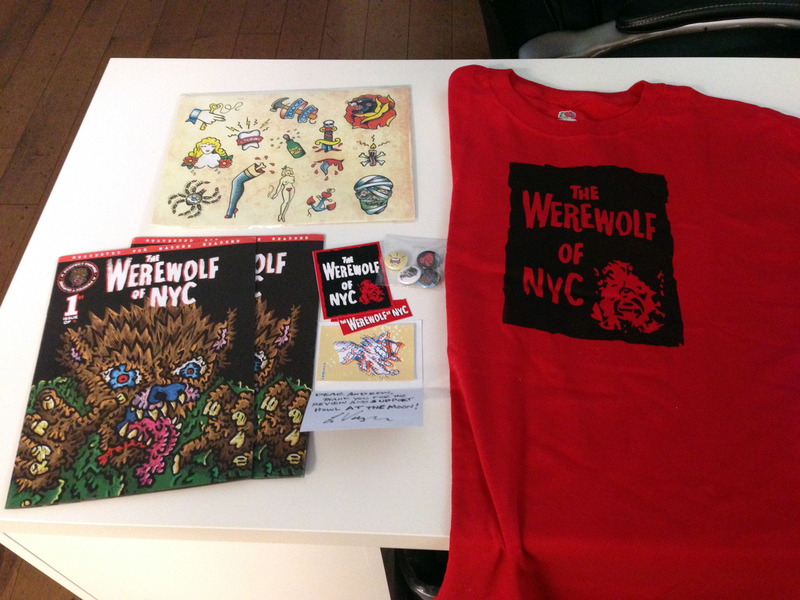 If you want to get the comic, the sticker or the shirt (in non-limited black), you can visit the Werewolf of NYC shop. If every Kickstarted, Indiegogoed or otherwise crowdsourced project I backed resulted in stuff like this showing up at my office, I’d be broke in the time it took you to read this. Thanks, Edwin! I can’t wait to read about Albert’s troubles on the train ride home.